We know that is not true today! Many reject the wisdom and teaching of the Ten Commandments. Why is that? Think about the Ten Commandments. Written on stone speaks of their longevity, written on both sides clearly speaks of their comprehensive completeness, written by the finger of God speaks of divine nature and direction. The ten words are simple yet profound words that show us how to respond rightly to God and man. Why do so many people have a difficult time distinguishing right from wrong? I would like to tell you it isn’t so much distinguishing between right and wrong as much as deciding to do right. God’s words sound like a trumpet blast to call us to a point of decision. Joshua said clearly in his farewell address to the nation of Israel choose this day who you will serve. 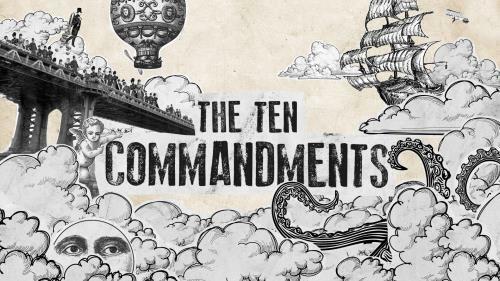 The Ten Commandments and especially this first and foundational of them all loudly and clearly call us to decide to live God’s way. It is as if God is saying “Now hear this, I Am! !” What a clear statement of the reality of God. Realize that there is a creator and controller of the universe. The Bible is speaking of the fact of God. The fool says I’m not interested in nor do I need this creator and controller of the universe. Imagine that you were at lamberts café. Lamberts is the home of throwed rolls. They are also the home of bringing pan of food to your table. They offer Macaroni and tomatoes, fried okra, blackeyed peas, and so many wonderful southern style foods. If they offer you any of these foods and you say no, no okra. You are not saying the okra doesn’t exist. You are saying I don’t want any of that. I don’t need any of that at all. That is what the fool says I don’t need any of that at all I’m just fine. I’m in no way interested in God. How sad since this word is supposed to call us to recognize that He is God, and He is God alone. God is insisting that all other gods (little g) are frauds. In the New testament Jehovah is perfectly pictured in Jesus Christ. This is an exclusive Claim. It is not politically correct, or popular, but is pure truth. Jesus said in John 14.8 if you’ve seen me you’ve seen the Father. I and the father are one. There is none that compares to Him. There are many supernatural creatures in the universe, angels, demons, but there is only one Supreme being God Almighty. In this first command God is saying I am the one and only true God and I claim your worship by right of Who I am and what I have done. In these words we are called to acknowledge Jehovah, Jesus Christ as the sole divine authority for life, the sole focus of our worship. As much as it is a call to recognize Jehovah alone, it is a call to reject other gods. Why if God is God alone would we be given the command to not have any other God? Even false God’s have a kind of spiritual power over their worshippers. Many false god’s are demons in disguise. To understand this you have to understand where Israel was in their journey with God. The Israelites had come out of a polytheistic or many god Egypt. They were headed to Cannan who served and or worshiped multiple gods. The Egyptians bowed down and worshipped the gods of war, love, light, darkness, fields, and rivers to name a few. They bowed down to half man half animal depictions of their gods. The Israelites were no better. Ezekiel 20.7,8 God clearly told all Israel to get rid of the Egyptian gods, but the people of Israel failed to do so.